Hmm.. looks like SimplyLearnt kind of story is getting vindicated. Rediff ended up making investments in an online test preparation product. Check this out. 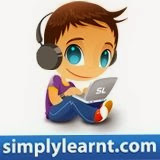 SimplyLearnt is continuously trying to become a student (preparing for any kind of entrance tests) best friend. Keep looking at this blog to check out our efforts. If you have any ideas on what all can help our students to prepare better for tests - please write in the comments below.